Stephen Sondheim's music and lyrics stand as milestones in the world of American musical theater. Now, for the first time, some of his best-loved songs from acclaimed shows are included in a 25-minute choral medley arranged by Mac Huff. 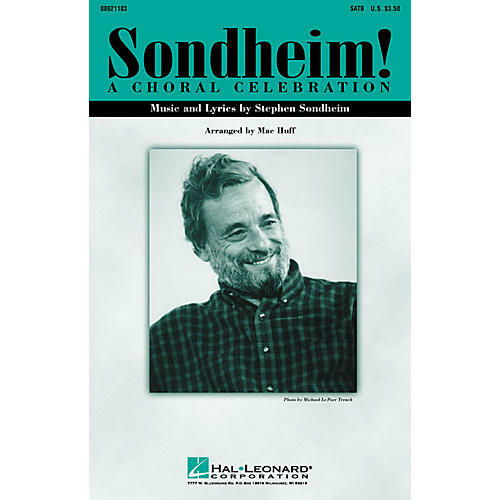 Both concert and show choirs alike can now experience and celebrate the creative artistry of Stephen Sondheim. Songs include: Comedy Tonight, Into the Woods, Putting It Together, Not While I'm Around, Losing My Mind, Send In the Clowns, Company, The Little Things You Do Together, Being Alive. Available separately: SATB, SAB, Instrumental Parts (Combo), ShowTrax CD.